Hi there i am looking at fixed lights to shoot products. Could you link me to any good system that would provide for very basic needs. There are as many ways as you want. I use continuous lighting, that's pretty basic and easy. Others have really smart store and modeling light systems, they know what they are doing. 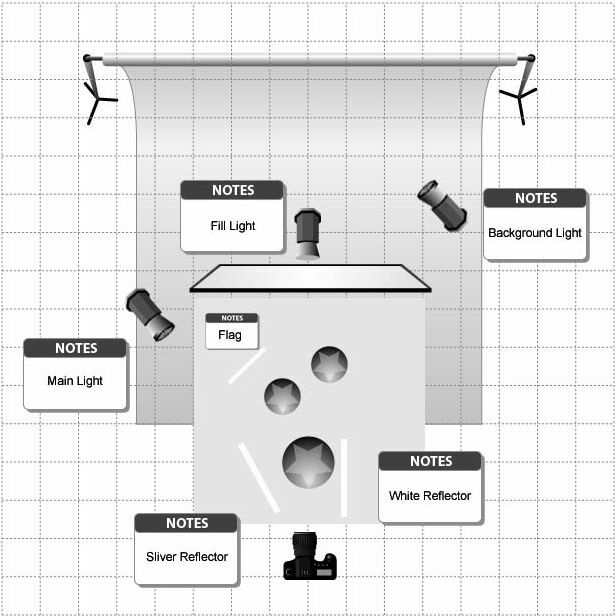 Everyone probably has reflectors, screens and soft boxes or tents or something to diffuse the light. You can make do with foil on cardboard, note cards, flags from old pants or cardstock from a craft store. You can make your own diffusers or buy an umbrella or get a large softbox. What I'm getting at is, there is no end and you can work with your own creative skills making tools that will help you make the shots. You don't need to spend money on expensive equipment. Whatever light source(s) you choose, they all need to be the same. For that reason I've tried to stick with "daylight" which in itself starts to be a problem, because one light sources Daylight, is not the same as another, and we want close or identical. Daylight LED bulbs are economical, I used twist tubes before that. They aren't the same, but LEDs run longer and cooler. Everything in this example can be made on your own, except the lamp holders and tripods kind of things, and you can hang a piece of linen or black felt/velour for a backdrop. Thin material or translucent plastic for the soft lighting. Reflectors gold, silver, white, make your own. The flag and anything else like that is a piece of cardboard. Just ideas, but hopefully you see what I mean. You can do what you want and make most of what you need - to get started. I got my first at a resale shop for a few bucks each, gooseneck lamps, or reflector bulb holders? LED light panels from eBay, some come on clamps or holders. I have a few of these that are good for outdoors, travel and lightweight. The holder is usually my hand or a tiny pocket tripod. They have a dimmer wheel, use standard batteries or a common Sony NP-F battery. I'm not so sure these are "Daylight" like outdoors or the same as a flash. Ring Flash, also eBay, that's really LEDs and can be continuous, has a step dimmer (unless it's different from the one I picked up). Good fun, includes adapters, can be used outdoors for plants and bugs or ? Filters which I question, but, one is a diffuser. Ecosmart LED bulbs from Home Depot, 100W that I use on the light table, are 5000K not identical to a flash that would be 5200 to 5500K, see where this is going? You can make all kinds of things for yourself and your biggest headache and problem, will eventually be mixed lighting which is impossible to correct, or nearly impossible. All the same or very very close. LED bulbs, $9 each, light holders, where you can find them, LED lighting eBay under $20 each. 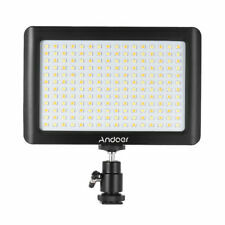 Just some ideas, but I hope that's helpful for "getting started" budget lighting. Bad Behavior has blocked 58790 access attempts in the last 7 days.